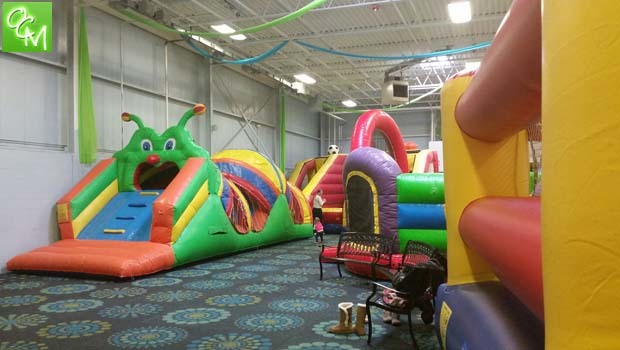 Inflatable Playspaces Royal Oak offers inflatables and bouncers for rent, an indoor play facility for birthday parties and open play times, and more! Inflatable Playspaces is a family owned business that understands the importance of kids parties. Inflatable Playspaces offers inflatables for birthdays, graduations, holiday parties and school events… and are dedicated to making your event memorable. You choose to hold your event at your location, or at Inflatable Playspaces in Royal Oak. Inflatable Playspaces offers Open Jump times during the week. Call ahead for details. Inflatable Playspaces in Royal Oak can take care of the party favors, too so there’s no need for treat bags. They can provide for your guests: Make-A-Bear, cotton candy, pucker powder, popcorn, Snokone, hotdog steamer and facepainting. Inflatable Playspaces in Royal Oak can customize their facility for your special event. They also offer sleepovers and drive-in movie parties with a giant inflatable movie screen. Inflatable Playspaces offers all kinds of party services for children of all ages. Visit the Oakland County Moms Birthday Party Directory to find more info on Metro Detroit birthday party places, party packages and Metro Detroit birthday party venues. Contact us or call us at 248-534-3934 to be listed in our Birthday Party Directory or on this Metro Detroit birthday party places page. Inflatable Playspaces Royal Oak also offers birthday party packages. See related posts below for more info on Inflatable Playspaces Royal Oak birthday parties.